For most of the year the small hamlet of El Rocío is just about as deserted a place as you could wish to find. Its wide, sandy streets are lined with impressively large houses complete with verandahs but they are usually uninhabited except at the time of the pilgrimage. It’s the pilgrimage which brings El Rocío to life, the Romería Del Rocío, amazingly, perhaps Spain’s biggest festival. 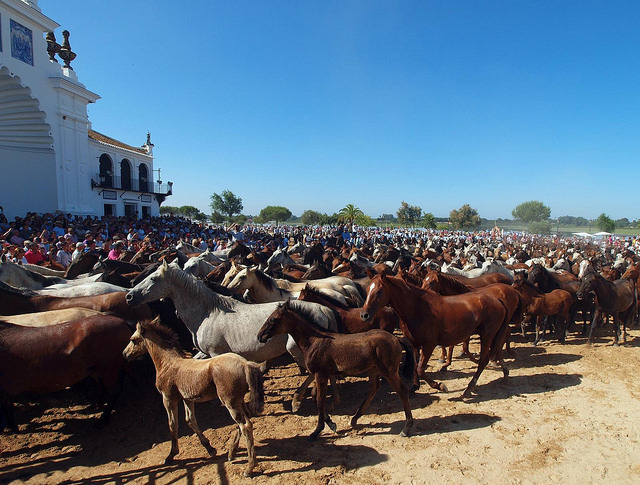 El Rocío, on the edge of the Parque Nacional de Doñana, near the town of Almonte has a permanent population of about 700 people but for the weekend before Pentecost Monday as many as a million people can throng the streets where normally you might see one man and his horse. This is one of the few times of the year when the A49 Seville to Huelva road is jammed with traffic all its length and not just as far as the IKEA superstore. The traditional pilgrimage can be traced back to the 15th century when a hunter from the local village of Villamanrique discovered a statue of the Virgin Mary, La Virgen El Rocío, in a tree trunk near the park. The wooden figure of the virgin, which is believed by its devotees to help cure infertility, mental disorders and other diseases, is kept in the enormous church, the Sanctuario de Nuestra Señora de El Rocío which is usually simply referred to as the Ermita. The church itself was destroyed by the great Lisbon earthquake of 1755 but completely rebuilt fifty odd years ago. The devotions were originally very parochial affairs but, over the centuries, they became more widespread firstly as people started to return home to Andalucía and then as more and more pilgrims came with them. Since 1758 the event has taken place on the fiftieth day after Easter Sunday. Those impressively large houses in the village mentioned earlier are actually bases of the 95 brotherhoods, hermandades, who are the senior members of each romería. The pilgrims, known here as Rocieros, arrive with horses, wagons and elaborate flower-bedecked carriages designed to transport the silver and gold Madonnas to the Ermita on the Saturday morning. Most of the female pilgrims will be wearing bright flamenco-style dresses with their male counterparts having the short riding type jackets, traje corto, and wide-brimmed boleros. The procession lasts until the evening and is accompanied by masses of followers chanting, clapping and beating drums and the playing of tambourines, flutes and guitars. The whole thing is carried out to the accompaniment of fire crackers and crowds shouting out ‘Viva la Reina de la Marisima’ – ‘Long live the queen of the marshland’. The climax of the whole festival comes in the early hours of the Monday morning when the actual statue of the virgin is brought from the church and paraded throughout the town. Its frenetic passing through the hands of all the brotherhoods makes one wonder how it has survived for so long. There is much of the atmosphere of the famous Seville festivals about the Rocío pilgrimage but with a kind of Spanish Glastonbury feel to it. Many city dwellers will camp out in the fields of the surrounding Doñana National Park and there will be traditional singing and dancing going on for hours on end. You will be able to smell fried peppers, prawns and sherry and witness the first-time Rocieros being unofficially baptized. For most of the year this is a part of Spain for bird watchers and solitude seekers. An area famously rich in wildlife, you can see flamingos and storks and very little else whilst strolling across the marshes of the Guadalquivir delta. During the Romería, though, the chaotic crushes and seemingly countless numbers of people make El Rocío one of the most famous pilgrimages in Spain. Should you want to attend the festival yourself be aware that finding somewhere local to stay is going to be almost impossible unless you are camping and that access to the area around El Rocío is going to be very difficult especially as motorized access is severely restricted at this time of the year. It is, though, an ideal place in which to experience that strangely Spanish combination of religion and partying! 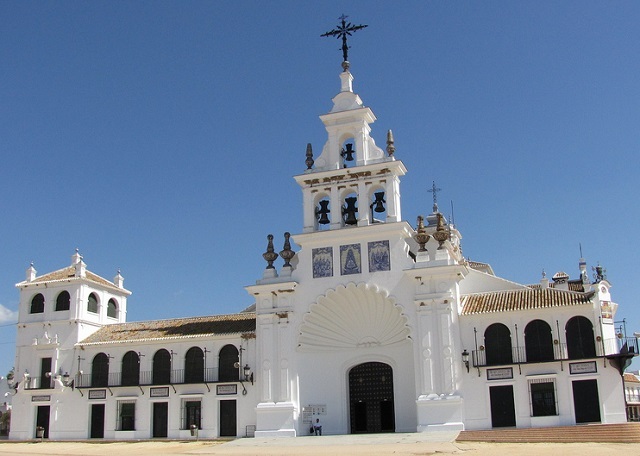 Have You Ever Seen La Romeria del Rocio? One of Spain’s biggest yet least known festivals outside the country. Have you ever had the opportunity to see this incredible event. What were your impressions? Where did you stay? Any travel advice is always welcome by our readers in the comments box below. Is a wonderfull fiesta , i would like to be there next year . Thanks Melissa – you’re absolutely right. It says the feast occurs on Pentecost Monday not Pentecost Sunday. 16 May 2016 seems like the accurate date. I am kind of picky because I am planning to go next year. ¡Viva la Virgen de las Marisimas! The pilgrimage takes place over the weekend before Pentecost Monday. That is the 7th weekend (50 days) after Easter Sunday. http://www.lumencamera.nl under “El Rocío pilgrimage”. Remember to reserve in time. Accommodation is expensive and sells out very quickly. But please go its worth every penny! In 2017 we will be there again. We attended in 2010 and 2012 ,camping outside the village outside the village in our motorhome. Adopted by locals and shared 2 truly memorable weekends. Turn right at electricity staion (just before) and camp in woods for free. Dont miss friday evening mule carriage parade and arrival of Triana ox waggons on the saturday morning to east of village. Also sunday servive. Virgen comes out of church at 3am approx on the monday morning and parades around village all that day.avoid crush !! Enjoy. Have attended about 20 years now.I live in Jaén and am a member of the Hermandad here.Each hermandad has a special weekend date for their own mass in the ermita. You can check which weekend has which hermandad’s mass.It’s great as not crowded. The camino is the most intriguing walking from 2 weeks to a few days to arrive the week before the Pentecost Sunday.